Join Lear Corporation, Presenting Sponsor of Winning Futures, for a day on the links at the historic and beautiful Indianwood Country Club. Consistently ranked as a top 100 classic American course, Indianwood has hosted four major professional golf championships. This fun-filled day of golf includes 18 holes of golf with cart, lunch, dinner, and plenty of opportunities to meet and network with automotive industry leaders. Our live raffle will include top-notch prizes including tickets and suites to local professional games and entertainment, and a few items that are guaranteed to tempt and surprise. Golf is played on both the Old and New courses. Teams that pay first are designated to play the Old course. When all Old course spots are filled, remaining teams will play the New course. All proceeds support Winning Futures. Online registration will open in April. For sponsorship opportunities, contact Julie Rayes at 586-698-4416 or Julie@WinningFutures.org. For general information, contact Kiana Elkins at 586-698-4077 or Kiana@WinningFutures.org . 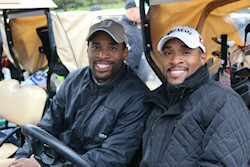 Check out photos from past Lear Golf Classic events!